Khudyev is featured in the Herald! February 23, 2017 – “Khudyev has dazzled this community in recent years with his leadership, his extraordinary conducting skills and his finesse as a composer. We are fortunate this brilliant young conductor chooses to bring his musical gifts to the young people and audiences on our Central Coast”. Maestro Khudyev is featured in the Great Lives column of the Carmel Pine Cone. 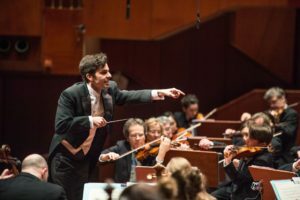 Farkhad Khudyev wins the 3rd prize at the 2017 International Sir Georg Solti Conducting Competition in Frankfurt, Germany!